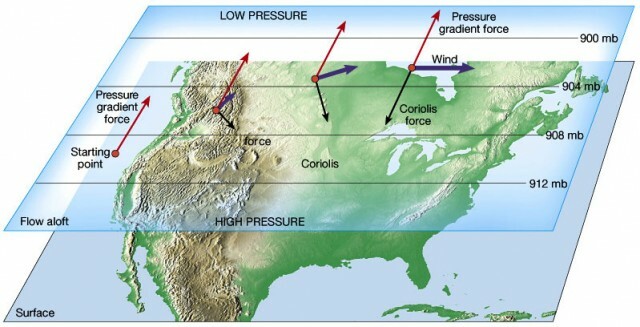 GEOSTROPHIC WINDS blow above the friction layer of the Earth, balanced between pressure gradient forces and the Coriolis force. Geo, meaning “Earth,” and strophic, or “turning,” refer to the Coriolis force of the Earth’s rotation. The Coriolis force causes wind to bend, eventually equalizing with the pressure gradient force. Geostrophic winds blow aloft and parallel to contour lines, or isobars. Isobars indicate varying gradients of pressure on weather maps, with different areas of pressure identified by isolines. Geostrophic winds occur aloft because land and water affect wind patterns in the friction layer of the atmosphere; they are more likely to occur when winds flow uninterrupted by frictional forces. Wind is the movement of air molecules from one area of pressure to another. Air pressure is the mass of the air particles in an air parcel. Different pressure areas occur from the heating and cooling of the Earth’s surface, resulting in air parcels rising or sinking. In warm air, pressure increases, and in cold air, pressure declines. Land features and water can also cause pressure changes. The relationship between these differing pressure areas is called the pressure gradient. Pressure gradient force causes air particles to flow from areas of high pressure to low pressure and seeks to reestablish equilibrium with the constant ideal pressure. The greater the difference in pressure, the faster the particles will move, thus the faster the wind speed. The Coriolis force, named for French scientist Gaspard Coriolis, results from the Earth’s rotating on its axis. As the Earth rotates, the Coriolis force pulls wind from its intended path, causing it to deflect. This force grows stronger closer to the poles and has no effect at the equator. The Coriolis force affects any free object, such as an airplane or ocean current. In the Northern Hemisphere, the Coriolis force pulls winds to the right, in the Southern Hemisphere to the left. An object’s speed and latitude affect the degree of the Coriolis force, and as an object’s velocity increases, so does the Coriolis force. The Coriolis force affects only wind direction, not speed, and is more substantial over longer distances and larger regions. Geostrophic winds result from the interaction of the pressure gradient force and the Coriolis force. Above the friction layer, winds are free from interfering obstacles that slow wind speeds and reduce the Coriolis force. Pressure gradient forces increase wind acceleration. As wind speeds increase, the effect of the Coriolis force increases, pulling winds farther and farther from intended paths. The Coriolis force occurs only when pressure gradient forces set air into motion. Ultimately, the increasing forces of acceleration and direction counteract one another. In the Northern Hemisphere, the Coriolis force pulls farther and farther to the right until it completely opposes the pressure gradient force, and the net force becomes zero. At that equilibrium, winds blow at a continuous speed, parallel to isobars. Because geostrophic winds reflect isobaric delineations, wind speed measurements can help determine isobaric contours. Also, by using Buys-Ballot’s Law, an observer can determine the location of high and low pressure areas. Dutch meteorologist Christoph Buys-Ballot determined the directional relationship between wind and different pressure areas. An observer standing with his or her back to the wind turns approximately 30 degrees to the left. To the observer’s left will be an area of low pressure, and an area of high pressure to the right. Normally observed winds are not often geostrophic, as friction and other forces affect these winds. But by studying geostrophic wind approximations above the friction layer of the atmosphere, meteorologists can learn more about different factors influencing real wind.